I just became a Southerner when I relocated to Florida. But I grew up on "down-home" southern cooking. My northern mother learned to cook from her southern mother. So naturally, I cook mostly southern-style. Living in Italy had added to my kitchen expertise. But I wanted to expand my culinary horizon even more. So when I heard about a couple of cooking classes in Wisconsin, I thought it would be worth a try. 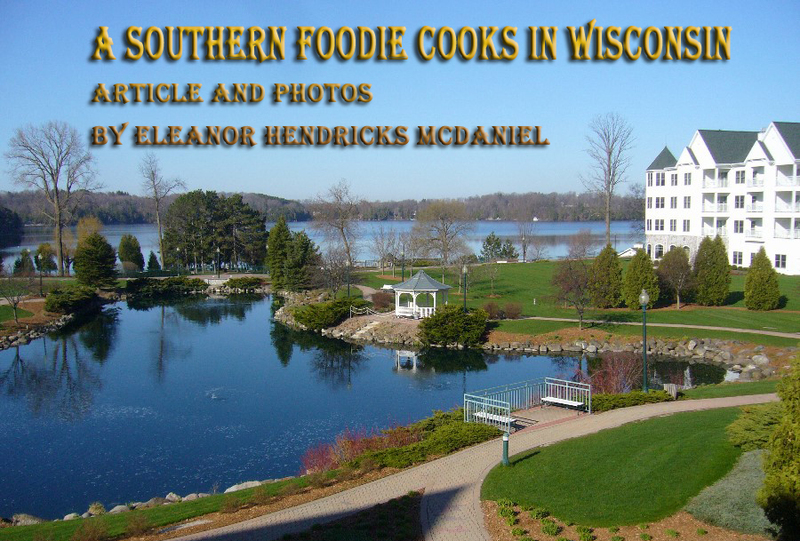 I flew into Milwaukee, and was whisked the short hour to the village of Elkhart Lake where I checked into the Osthoff Resort (http://www.osthoff.com). This sprawling AAA Four-Diamond Resort overlooks lovely Elkhart Lake. My rooms in the all-suite hotel included a full kitchen and dining area. The living room featured a gas fireplace which, I'm sure, comes in handy during Wisconsin's frigid winters. A balcony stretched across the living room and bedroom, and faced the lake. 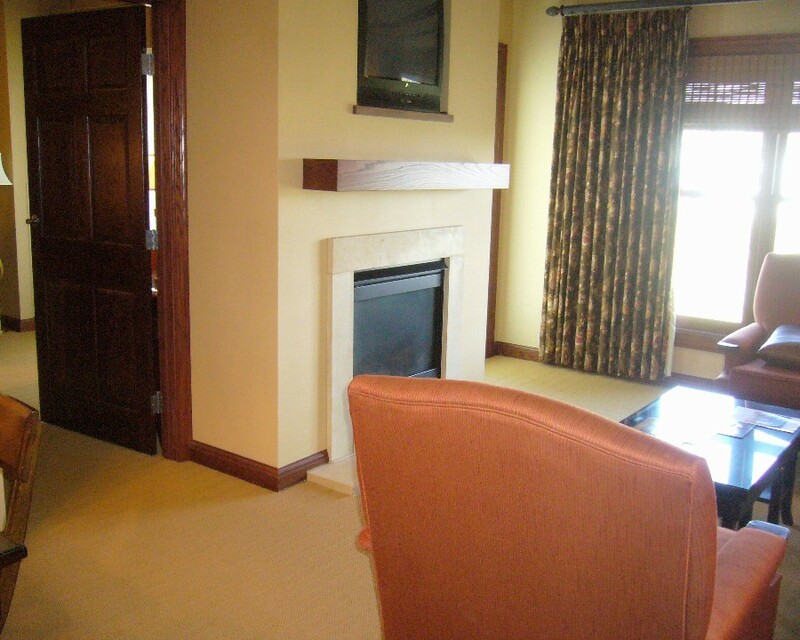 A living area in the all-suite Osthoff Resort. The amenities at Osthoff Resort run the gamut from total relaxation to "rev-up-your-heart" action. There are indoor and outdoor pools, fitness centers, saunas, whirlpools, hay wagon rides, biking, beachfront bonfires, beach volleyball, nearby golf courses and more. 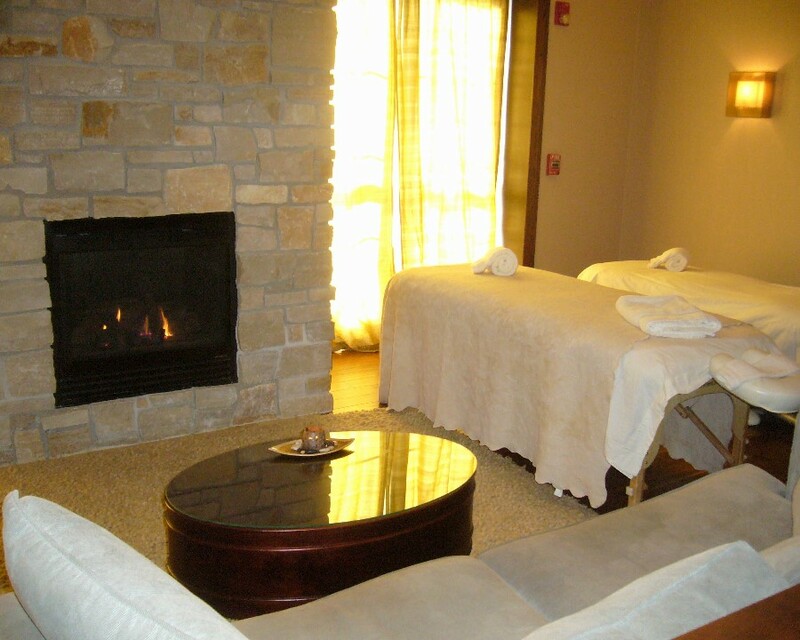 Book a cozy room for a couple's massage at the Aspira Spa. Within the resort was the cooking school, L'ecole de la Maison(http://www.cookingschoolatosthoff.com). Under the tutelage of chef instructor, Scott Baker, a small group was taught how to prepare a full menu of French cuisine in a three-hour workshop. (Longer courses are offered also.) Some of the proposed menu items consisted of Strauss Lamb with Parsley Crust and Madeira Sauce, Steamed Asparagus with Hollandaise Sauce, Crepes Suzette and more. 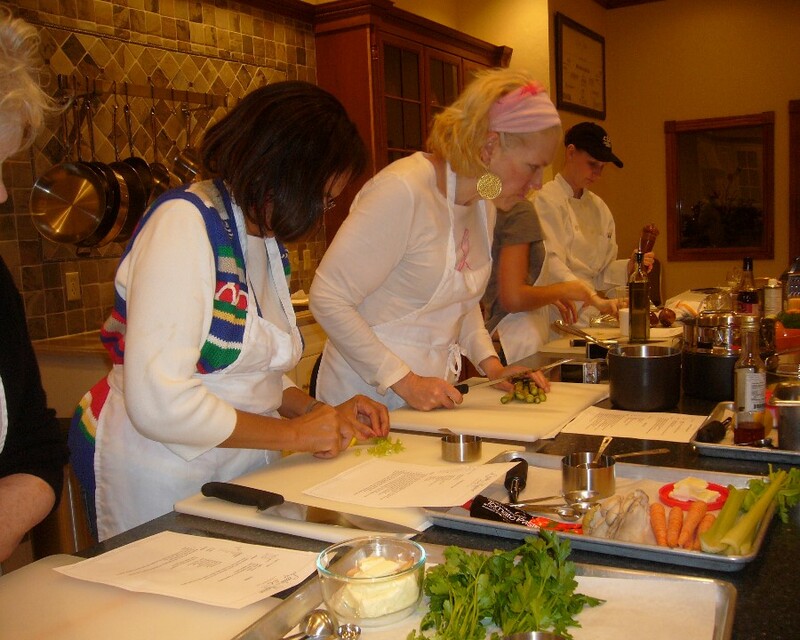 A class prepares French cuisine at L'ecole de la Maison. My assignment was to cook Coquilles St. Jacques au Gratin with Grand Cru Gruyere – a first time dish for me. Unless you're Julia Child, French cooking can be daunting. It was doable, thanks to excellent instruction, but I chopped and stirred and chopped and stirred. Real kitchen work… I must admit that the best part of the lesson was consuming the meal. Will I make it back home? Only time will tell. The history of Elkhart Lake travels back to when Native Americans named it "the chosen place." It sits fringed by a forest of cedar trees, and is spring-fed. The water itself has always been a draw – turquoise-hued, 120 feet deep and crystal clear – so clear that fishermen can see what's swimming below. Anglers now share the lake with boats, kayaks, canoes, pontoons, sailboats and other watercraft. 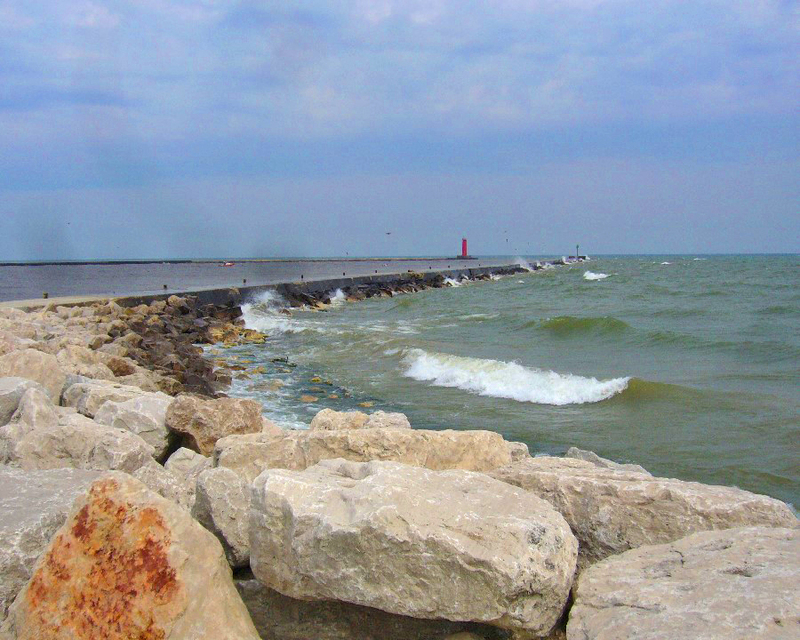 Turbulent waves have dubbed Lake Michigan the "Malibu of the Midwest." 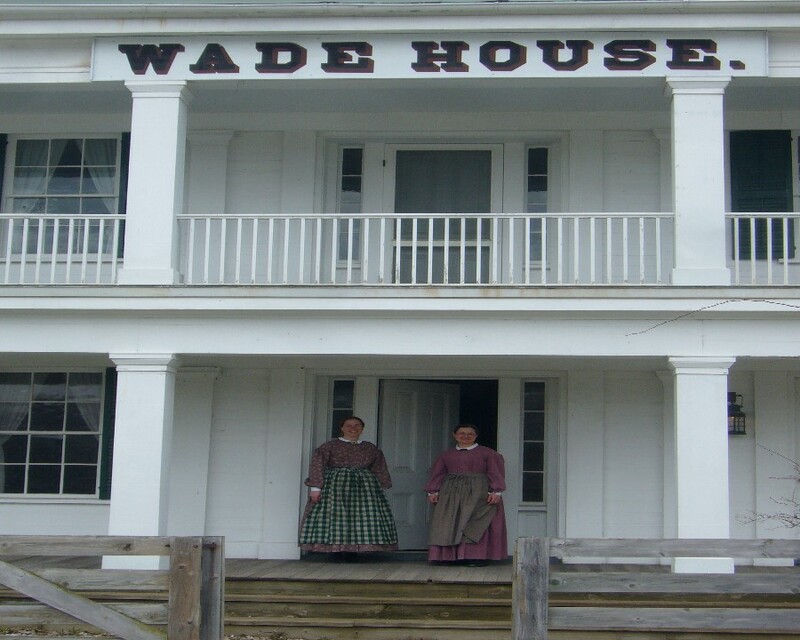 I arranged to join a class at the historic Wade House (http://wadehouse.wisconsinhistory.org), a former 1860s inn and stagecoach stop in Greenbush. Under the course name, "Hearthside Dinner," guests are invited to prepare comestibles over a hearth and a wood-burning stove. Our group of participants chose their dish assignment blindly from a deck of menu cards which included a bill of fare that featured pork loin roast, red cabbage with apples, glazed carrots, cranberry muffins, bread pudding and squash soup, accompanied by cider and freshly ground coffee. Docents Betsey Urven and Kathy Dimig teach 19th century cookery at the historic Wade House. Some of the student cooks went into the room with a large fireplace to prepare bread and desserts. Baking pans filled with batter would be set into metal closed containers and placed in the hearth. I remained in the room with the big iron stove. It had been burning wood since before we arrived, and was hot to go. My task was to whip up mashed turnips. I peeled the turnips and cut them into large chunks that went into a pan of water and put on the surface of the hot stove. After the turnips were cooked throughout, they were soft enough to squash (pardon the pun). I used a wooden club-like masher, mixed in salt, pepper and generous lumps of hand-churned butter. 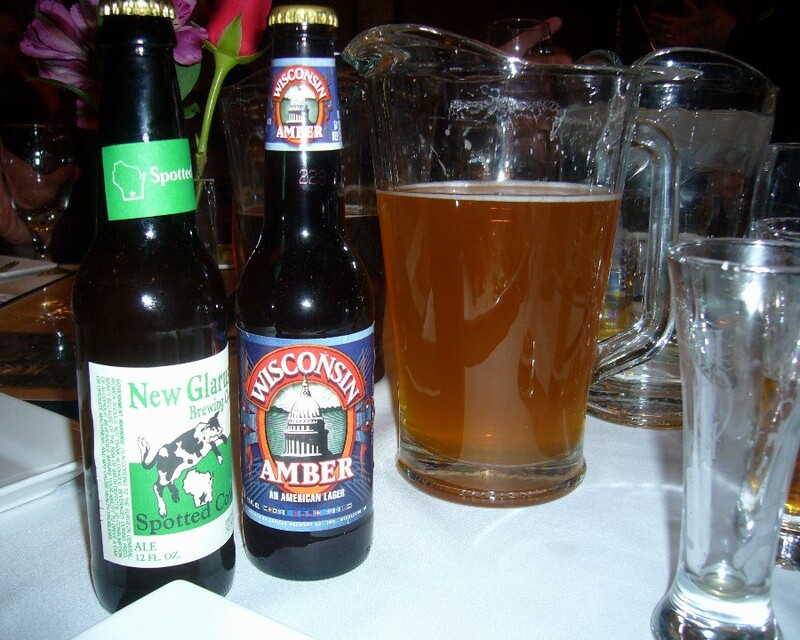 Craft beers rule in Sheboygan County. One of the other cooks was grinding coffee by hand. When she had finished, it went into a coffee pot and boiled! No Keurig pods here. I expected a muddy, strong hot beverage when drunk. But it was much better that what I get at Starbucks. After concluding the delicious old-fashioned meal which was served at a groaning board that served weary 19th-century travelers in the old dining room, we cleaned up, washing dishes in a sink, fed by a water pump -- 19th-century style. Then the docents/ cooking teachers, Betsey Urven and Kathy Dimig, showed us around the ancient house. Sheboygan has a lively arts scene. Twenty-five minutes away from my base at Elkhart Lake is the city of Sheboygan that borders on Lake Michigan, "the Malibu of the Midwest," where wind and kite surfers soar high, propelled by strong gusts. Serious fishermen arrive to test their skill at landing a ten- to 40-pound trout or Chinook (a.k.a. King Salmon). But the soft sand beach is perfect for families and sunbathers. 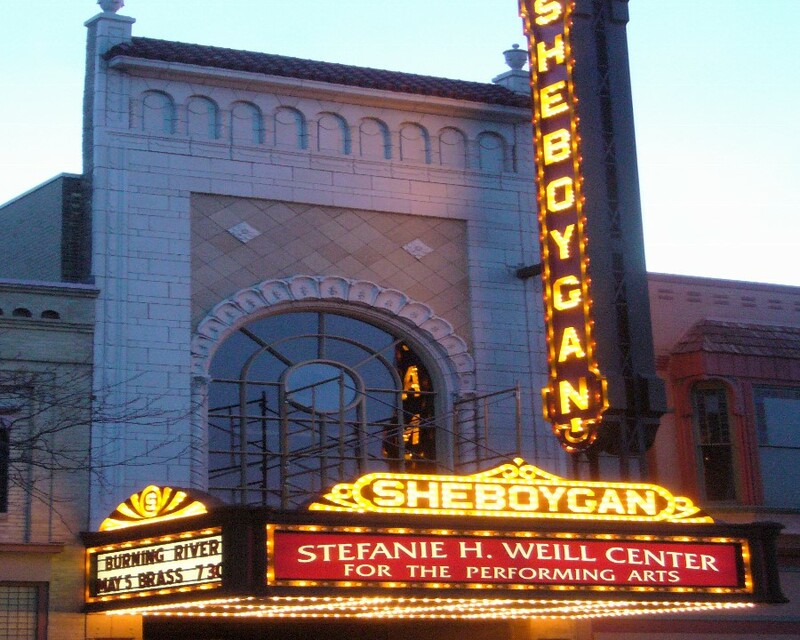 Sheboygan became a city in 1846. 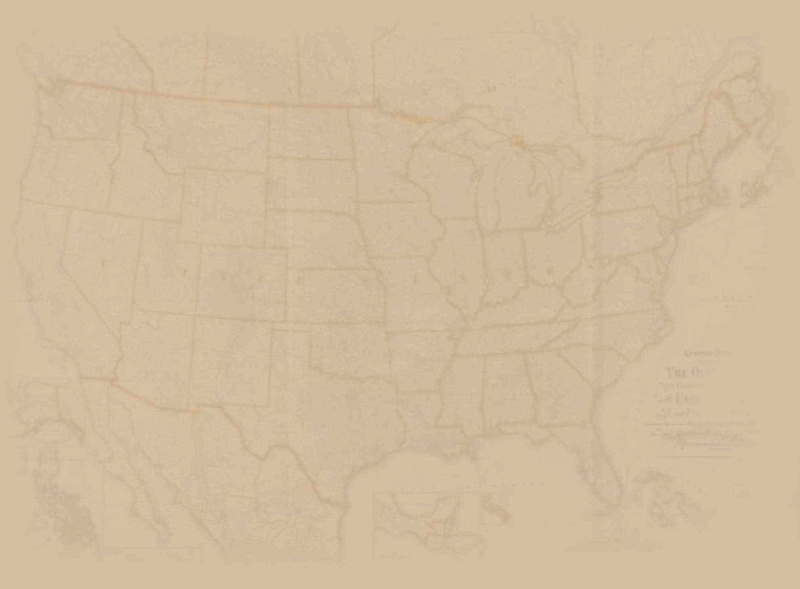 It had been settled in the early 19th century by pioneers from New England and New York, but their culinary influence hardly made a dent in the area. It wasn't until the vast migration of Germans appeared, and, by 1849, their culture had become the dominate force, especially with food and drink. The city is known as the "Bratwurst Capital of the World." 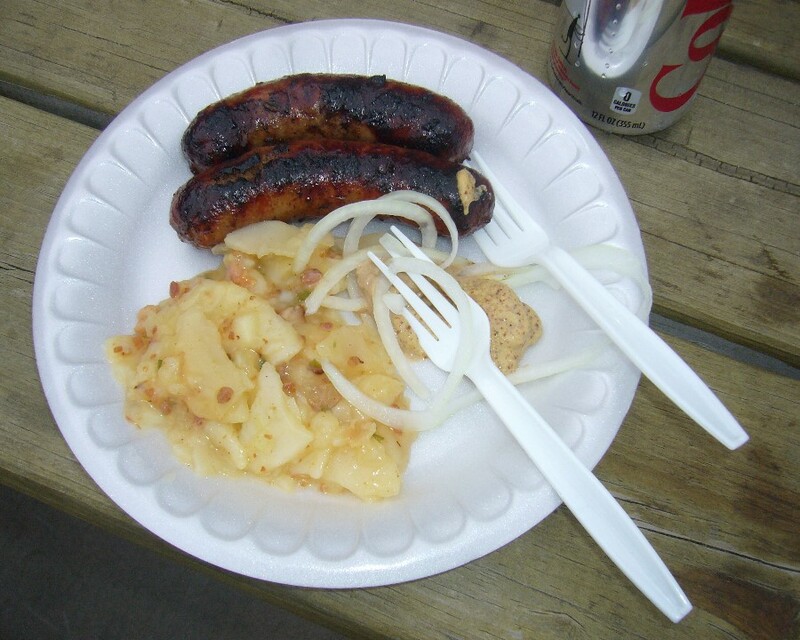 Brats and German potato salad can be found on most lunch menus in Sheboygan. I toured the award-winning Miesfeld's Meat Market kitchen (http://miesfelds.com/wp) where they've been making the famous German sausage since 1941. The worker demonstrated sausage making with an automatic machine that stuffed a long intestine with ground sausage meat -- quick and easy. It took much longer in the old days when workers did it all by hand. Then the "stocking" was twisted and cut into individual links. 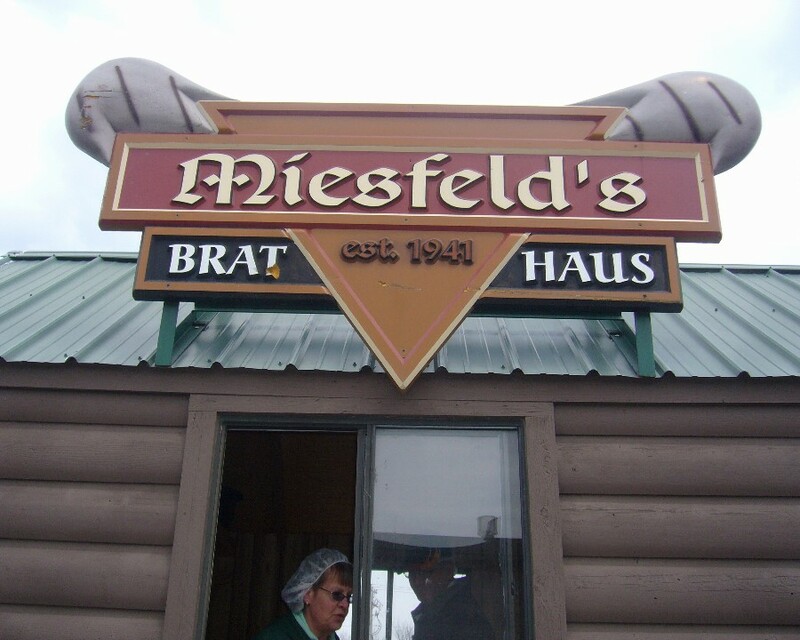 I noshed on a grilled one at their Miesfeld Brat Haus. Miesfeld's Brat House serves the popular German sausage. When I returned home to my southern kitchen, I realized that I was ready to show off for dinner parties, but for everyday fare, "southern-fried" was still on my taste bud horizon.